I got a question for you about GERD yesterday and had to look it up--hadn't ever heard of that before. It turned out to be gastric reflux, which I had heard of, thank goodness. I have never heard of this in dogs before, but a reader asked for symptoms, home remedies and treatment options, if home remedies do not work. She is using a human antacid currently, given at bedtime. Apparently the symptoms are occurring in the middle of the night. I do have clients that comment on their dogs' excessive belching annd increased GI noises. When this happens every now and then, i.e. less than once every 2 weeks, then I discuss at-home remedies with the owner. Maybe that is 1/2 a Pepcid pill for a medium sized dog or possibly a whole pill for a large breed dog. But when a client mentions recurrent GI noises and belching, especially if the owner thinks it is associated with 'reflux', then we need to dig a little deeper. There are many causes of recurrent reflux that must be ruled out, as it can possibly lead to esophagitis or a stricture in the esophagus. If a dog suffers from vomiting or chronic belching, it is time to talk to the veterinarian about running tests to try to figure out the reason. Bloodwork, possibly some radiographs (x rays), and then biopsies may be indicated. Once these tests are performed, it can be determined if there is a need for just a food change, say to a hypoallergenic diet or even to a diet higher in fiber. Or maybe an antacid could be added in to the treatment plan along with an antibiotic for the short term. What we want to avoid is thinking that chronic belching and regurgitation are normal. This can lead to more complicated problems, and it should be attended to promptly. 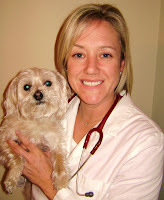 For more information on Dr. Jacki and her practice, you may find her at 4 Paws House Calls. A personal appointment will likely provide more specific information on your dog and your specific questions. Dr. Jacki's opinion or advice does not replace an actual exam with a veterinarian.